This tree is 62 years old. It’s been through fire and drought, plague and plenty. And all of this is recorded in its rings. Each spring and summer a tree adds new layers of wood to its trunk. The wood formed in spring grows fast, and is lighter because it consists of large cells. In summer, growth is slower; the wood has smaller cells and is darker. So when the tree is cut, the layers appear as alternating rings of light and dark wood. 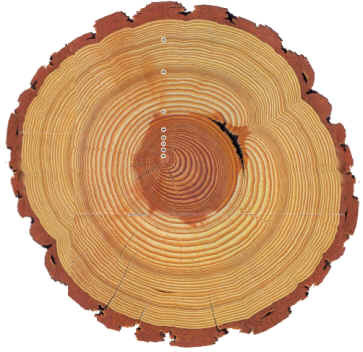 Click the cross section of the tree ring above to view the whole ring as it came from the tree. Count the dark rings, and you know the tree’s age. Study the rings, and you can learn much more. Many things affect the way the tree grows, and thus alter the shape, thickness, color and uniformity of the rings. The tree a loblolly pine is born. The tree grows rapidly with no disturbance. There is abundant rainfall and sunshine in spring and summer. The rings are relatively broad, and are evenly spaced. When the tree was 6 years old, something pushed against it, making it lean. The rings are now wider on the lower side as the tree builds “reaction wood” to help support it. The tree is growing straight again. But its neighbors are growing too, and their crowns and root systems take much of the water and sunshine the tree needs. The surrounding trees are harvested. The larger trees are removed and there is once again ample nourishment and sunlight. The tree can now grow rapidly again. These narrow rings (at letter “G” on the tree ring above) may have been caused by a prolonged dry spell. One or two dry summers would not have dried the ground enough to slow the tree’s growth this much. Another series of narrow rings may have been caused by an insect like the larva of the sawfly. It eats the leaves and leafbuds of many kinds of coniferous trees. See what tree rings tell us about the life of a tree. Pictorial timeline shows how a pinecone sheds a seed and becomes a tree. See a cross-section of the inside of a tree trunk.